Portland, Oregon [May 3rd 2013] Back to defend their 2012 Oregon Trail Rally victory, Subaru Rally Team USA’s David Higgins and co-driver Craig Drew, seek to extend their National Championship points lead at Oregon this weekend. The 2013 season is off to a great start for the Subaru Rally team with a second overall at the Sno*Drift Rally and also taking the outright victory at The Rally in the 100 Acre Wood. As always Higgins and Drew have their work cut out for them keeping Hoonigan Racing's Ken Block and Alex Gelsomino along with the Rockstar Energy Drink Team of Antoine L’Estage and Nathalie Richard at bay. But what maybe a greater factor for victory will be road position, it has been unusually dry in the area over the past week, and with temps expected in the upper 80's over the rally weekend, dust is going to be a major issue. Unlike WRC events where there are 10 or more road positions to choose from, Rally America front runners have only three options, to run first on the road and sweep the loose gravel, but avoid all dust, or run second or third hopes for a cleaner line and also gamble that the organizers will extent the dust window enough for a clear view. Saturday will surely be the toughest in regards to dust with the tree lines stages, Sunday should be less of an issue with the wide open stages on the high plaines of Dufur. 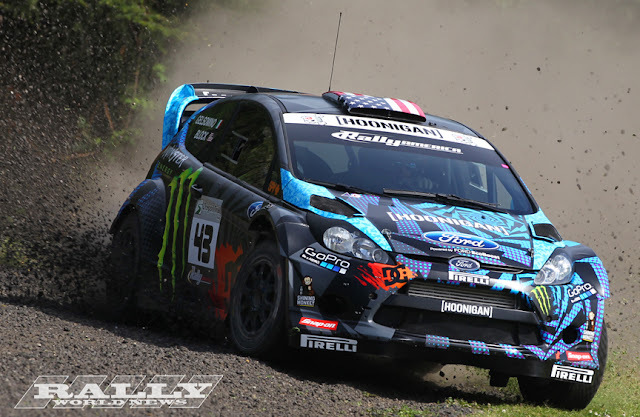 Ken Block and co-driver Alex Gelsomino, have returned to the 2013 Rally America Championship after a two-year break with one goal in mind, and that was to capture a Rally America Championship title. Despite many impressing victories by Block and Gelsomino down through the years, they have yet to secure a Championship. Unfortunately the 2013 Championship battle has got off to somewhat of a disastrous start for Block, with electrical problems at Sno*Drift and an off at 100AW, Block and Gelsomino find themselves back in 11th place in the points battle. For Block to keep any chance at the title hope alive he must grab the overall victory this weekend in Oregon. Antoine L’Estage and Nathalie Richard have stepped up their game for the balance of the 2013 season with an upgrade to a WRC Mitsubishi Lancer. Although the 2005 MML Sports Lancer may be seen as somewhat outdated among the current class of WRC cars, this is still a very potent machine in the hands of the right driver. As this is the first outing for L'Estage and Richard in the new car, we don't expect to see Antoine setting any blistering stage times on the opening day of the rally, although a stage victory is never out of the question for this talented Canadian driver. Come Sunday with the flat out stages in the Dufur area, I fully expect to see Antoine pushing near the limit. Indonesia’s Rifat Sungkar will add an International flavor to the rally, Rifat is making his American debut. 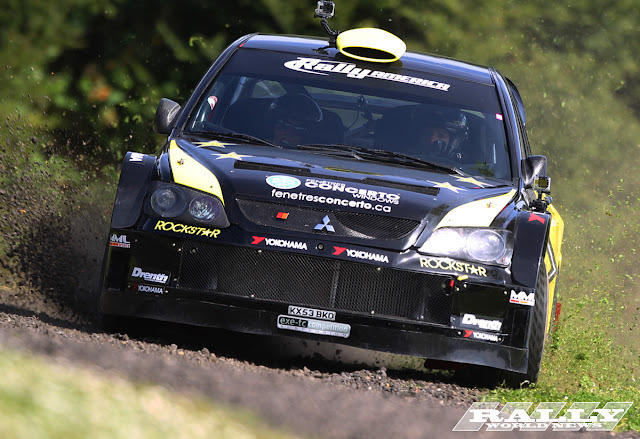 Sungkar is a WRC France Group N winner and will pilot Antoine L'Estage's Open class Mitsubishi EVO X. Although Sungkar is an 8-time Indonesian Rally Champion its hard to gauge how he will match up to Higgins, Block and L'Estage, or will he be able to match the past of other Rally America SP class drivers. Rifat will have irish co-driver Marshall Clarke to calling the notes, Marshall has a lot of prior experience on the Rally America stages, and should ease the learning curve for Sungkar. Scion Racing Rally xD’s Andrew Comrie-Picard and Jeremy Wimpey have been tearing it up in 2013, with outright victories at Sno*Drift and 100AW the Scion Racing Team has already a sizable lead in the 2WD points battle. Ford rivals, Edward McNelly and Ole Holter are holding second in the points battle, but have yet to match the speed of the Scion in the experienced hands of ACP. 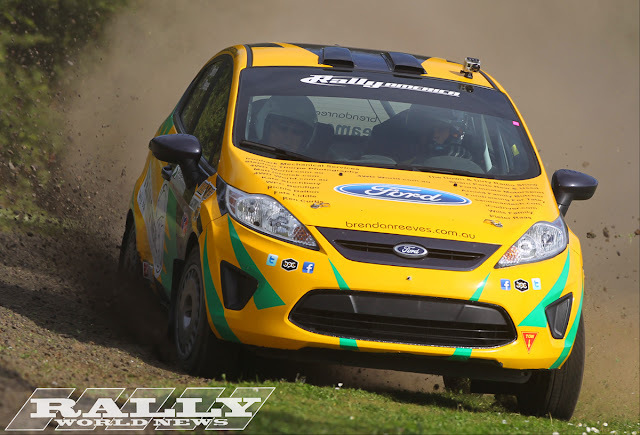 With the notable absences of Chris Duplessis in 2013, Ford's chances of retaining their Championship title for the R2 Fiesta is slipping fast. For the Oregon Trail Rally Team O'Neil has brought in a ringer of sorts in one Brendan Reeves in hopes of reining in the Scion. Reeves who hails from the land down under has been a top runner on the WRC Academy in the past few years. 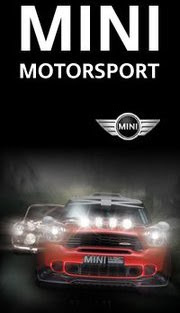 Reeves will be joined by his regular co-driver and sister Rhianon Smyth. We got a brief glimpse of Reeves pace on the short shakedown stage last night, and to say the lease this is one very impressive driver, question is will the Team O'Neil built R2 Fiesta stand up to the pace of the WRC level driver? Northwest Rally fans will surely be vocal in the support of local 2WD hero Cody Crain, Crane will make a return to the Rally American for the first time tin 2013. Look for Cody's little green Civic to be a full tilt as this local driver will know these stages better than most. The Oregon Trail Rally is the third round of the Rally America National Championship and is the only three day event on the national calendar. Each competition day is a separate regional event producing a regional winner. The Oregon Trail Rally begins on Friday, May 3rd at Portland International Raceway with four fan friendly stages before moving to Hood River, OR on Saturday and Sunday.